My husband bought a used Toyota Camry to put miles on driving back and forth across town for his work car. He drove it for three years and it served its purpose for us, he was able to save 30,000 miles from being put on our newer cars. The Camry was in great physical condition but we did not know anyone who wanted to buy the car and since we were not buying a new car, trading it in was not an option. When you try to sell a used car you deal with a ton of headache. You have to clean and detail your car, take pictures of it and try to make it look its best. You have to pay to post your car online or in the paper. You need a phone number just for people to call to ask questions about the vehicle so you don’t need to give out your home phone number. Once people ask you a million questions about the car then they want to come look at it, now you have to give strangers your home address. Now you have to arrange a time and make sure you are home to have strangers come over look at the car and then hope they actually show up and that you did not stay home for no reason. If they do show up they kick the tires, ask a million other questions and search every square inch of the car engine to trunk. Then if they like the car, then you need to let strangers drive your car. Now with your insurance, you have to trust that a stranger is not going to crash your car, steal your car by driving away and never coming back, you have to worry that they are going to beat on it to see how it runs, and then ruin the engine so now you are stuck with a car that is broken. If they really are interested and they don’t break your car, they might ask to show it to a mechanic, so you have to make time to bring the car to their mechanic, and even if it gets a clean bill of health, there is no guarantee they buy it. Then if they are really interested then it is time to haggle over price, they will point out every ding and scratch on your used car and try to get you to agree to a lower price. Now if you finally agree to a price there is the method of payment, you can’t accept personal checks, you need a cashiers check or cash, but you have to worry that it is counterfeit cash or a fake cashiers check. Now if they actually pay you legitimately you sign over the title to them and need to create a sold “as is” contract so they don’t come back to sue you if the car breaks down in a month or just stops running. Then there is the matter of the title. You have to hope that they actually transfer the title over into their own name and address so that if they use it as a getaway car or hit and run someone, that is not still listed under your name the police don’t come knocking at your door. I know people that have dealt with every one of these things when selling a used car. We wanted to avoid all of that drama associated with selling our car and even considered selling it to a junkyard so that we did not have to deal with strangers and we would then get $200-$300 for it. I called around that is what the junkyards offered me. Then I came up with the idea that we could donate it! Then I had to research to find a legitimate local charity that I could donate it to. We grew up owning a cabin right next to Camp Courage for the Courage Center so I was familiar with the great work Courage Center does for handicapped children and adults that is why I chose Courage Center. I researched online to find out the steps I needed to take to donate the car. I needed to contact the Courage Center to make sure they would take it, Then I filled out the online form that was printable off their website, I pulled the title out of the file cabinet, had my husband sign it over, then I brought the completed donation form along with the original signed over title to the post office and mailed it priority mail return receipt requested. I did that to ensure my car title was actually received and not lost in the mail. Within two days of receiving my title the courage center sent a tow truck to pick up the Camry. The Camry was sent to auction and the proceeds from the sale of the car all went to Courage Center. The Courage Center recieved a couple thousand dollars for our car and we received a personal thank you call and the tax deductible paperwork in the mail within 6 weeks. It worked slick! I think vehicle donation was a fantastic alternative to selling our car or selling our car to a junkyard. The sale of our car benefited a local charity in my state, and hopefully helped send a handicapped child to camp. Consider donating your car! 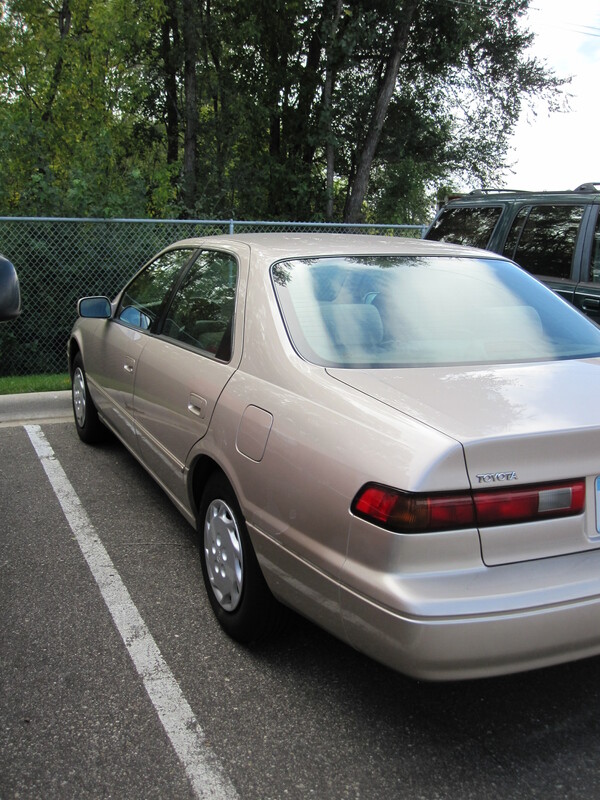 If you live in Minnesota and want to donate your vehicle to the Courage Center here is a link. We have two cars a little Volvo Station Wagon and a Chevy Truck, both white, both 2005’s. We bought them both the same week in July of 2005 and traded in our old cars. 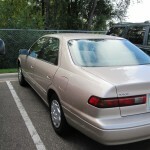 My husband traded in the old Durango, I traded in my dream car, the car I searched for for 3 years my 2000 Celica GT Convertible that I only drove in the summers, I did not want to get rid of my car but an infant car seat did not fit in that car without the passenger seat all the way leaned forward. I also realized that it would be a long time before I could drive down the road with the top down since I would have a baby in my car. I did not want to be that person driving with wind pelting their toddler who is strapped in a carseat. I have seen those people and feel bad for the kids, hoping that they are not getting pelted with rocks from passing vehicles. Converts are great for adults, not so functional with kids. Then I got my Volvo. It was rated the top compact car in 2005 for safety, so ready or not that is what I got. Well 4 1/2 years goes by now those new cars that we just got done paying for, are not so new anymore. My Volvo has 37,000 miles on it. The Chevy truck has 55,000 miles, they both need new tires, they both need brakes, and stuff just seems to start going wrong at the point that a car is paid off. Today, I was driving down the highway in 8 degree weather on my way to bring the kids to the Mall of America for the afternoon when the heater that was set at 90 degrees and on full blast, cuts out completely. I look down at the gauges, no warning lights, no temperature problems, I look and the lights are still on the heater, when just as sudden as the heater stopped it started back up again. It cut out for another second then came back on full force. I said out loud to myself, “Oh that was weird.” I kept driving, I had to make one stop at Goodwill to drop off some baby gear that I wont need any longer, pulled into the donation bay, shut off the truck, took the keys out of the ignition, opened the door and noticed that the heater was still running and blowing. I said out loud, “Oh that is not good! I started the truck, pulled out of the bay and stopped in a parking lot, turned the car on and off, tried to manually shut off the heater by the controls but it was stuck on. I started driving towards the highway, called my husband to warn him about the problem, and tried to create a plan. I ended up calling the car repair garage my brother works at across town and they were able to fit the truck in. I drove down there with my kids in the car, and my brother agreed to switch cars with me, he pulled out his babies car seat base, and I pulled out my two car seats and latched them in to his truck. At this point I don’t know if the car will be able to be repaired tonight, I hope so, otherwise I will be picking up my brother from work. All of this would be easier if I did not have kids with me, naptimes and lunchtimes to work around. Cars are nothing but trouble. Anxiety and MRI’s? Not a Good Combination! On Sept. 13th, I went to the hospital because I was not able to see right out of my eyes, it looked like crystals had formed directly in front of my eyes that I could not rub away, and I started to get a headache. Well I just would have drank some water and went to bed if I was not driving home from my in-laws house with my kids in the car. I stopped the car right before I entered the highway, rubbed my eyes, took deep breaths, took the kids out of the car to go for a walk to see if it would clear up but no luck. I called my in-laws who drove out to pick up me and the kids up and drive my car back to their house. I wanted to drink some water and lay down and see if I could see right again. After laying down for a while it was not helping and I my husband was worried since I had never had visual changes or a migraine in my life that I might be having a stroke, aneurysm or blood clot. My mother in law drove me an my kids home (45 minute drive) and she dropped me off at the ER where my husband met me. They admitted me to the emergency room, gave me an ice pack, checked my vitals checked my vision, and then wheeled me into the CT Scan. The CT scan came back clear so they gave me an IV and administered Benadryl and a smooth muscle relaxer medications which immediately stopped my headache and made my head so heavy I could hardly hold it up. After a few glasses of water and one more vitals check they removed my IV, and gave me my release paperwork. The Emergency room doctor referred me to have an MRI scan because this was my first migraine to rule out M.S. or inner ear problems. That day I went home and relaxed and took it easy since that is pretty much how the medication made me feel. A few days went by and no more headaches or visual changes, we drove out to pick up my car 3 days later and my father in law asked me when I have my MRI scheduled. Well I had no intention of having an MRI, I was fine! Why waste any more money or MRI resources from people who may actually need them? Now my husband and In-Laws were all explaining to me that I had to have an MRI and just to schedule it. I ho-hummed and gave in but knew that there was no way I could stick my body inside of a small tube, just watching them done on TV makes me nervous. The next day I called around and found out where I could get an open sided MRI because I thought that I could handle that, the appointment lady tried to convince me that I could handle the regular MRI with sedation and I assured her I did not want to be sedated at all costs. So they finally schedule me for the open sided machine. I mentioned to my mom that I was getting an MRI and she warned me that they were really loud so I should make sure I get hearing protection. I then put it out of my mind until I received the reminder phone call yesterday afternoon. I found the location on Google maps and went to bed early because I had to be across town at 7:45AM. I woke up at 6:00AM showered, made coffee, got ready and made sure I did not have any metal on. My husband stayed home with my kids so I drove off into the unknown. I made it there with not a minute to spare due to rush hour traffic, walked in filled out the 5 pages of medical history and permission forms. As soon as I handed in my forms my radiologist who I spoke with yesterday afternoon called my name. I stopped at the potty, deposited my purse in the locker and walked back into the big room with the giant open sided MRI. I did not even look at pictures of what it looked like online and it way more closed in than I thought something called open sided could be. The radiologist was very calming, he had a great mellow, almost hypnotising voice. He told me I was fine with what I was wearing and after I asked, assured me my under wire was fine in my bra and that I could keep my sandals on. He walked me thru the process that it would take 30 minutes for the first series of scans on my brain, that he would pull me out, put in the contrast dye in my vein and then 11 more minutes of scans on just my inner ears. He had me sit down, put in my ear plugs, put my knees up on a cushion for comfort and to keep me flat on my back, he put a mask over my face that snapped into clips to hold my head in place and help with the pictures since it was a head scan. He put two cushions over my ears to help keep my head still and to help with the noise and handed me a panic button and assured me he would stop the machine and run in if I needed help, I held onto that button with a death grip. Now it was time to put me in the unit. As the machine started to move my head further inside the big machine it became harder for me to catch my breath. I looked with my eyes only( because my head was immobilized) to my left to see light, and then to the right, then down at my legs. I started to panic. I started taking deep breaths, more breaths, closed my eyes and told myself to be thankful my hands were free and envisioned myself drinking a cold beer on a warm, sunny beach. I told the radiologist I needed to take my shoes off and he helped pull off my sandals quickly, after that I was able to calm myself down and relax. The radiologist asked me multiple times if I was alright, I assured him that I was ok now and he calmly reminded me that I could push the button anytime and that he would keep talking to me to tell me what was happening during the scan. Now that I was calm the scan started. My mom said it was loud, the radiologist said it was loud, it was not just loud it was a jackhammer loud! It was so loud you could feel it, It was like being inside a car when the stereo is on so loud your ears ring loud! I managed to keep calm during the noise, it kind of distracted me. I kept my eyes closed and thought about my kids. I loved that the radiologist told me how long each scan would take and how much time left in his soothing voice. Now it was time for the 2nd part of the scan. He slowly moved me out of the machine to put in the IV with the dye. Did I mention I hate IV’s? I cant stand having something stuck in me that I can’t take out! He assured me he would only keep the IV in until the dye was injected then remove it. He did not take off the mask and asked me to stay in position that it would take a minute to put in the IV and he would put me right back in. He quickly found the vein, tried to push in the dye in and it would not go in. He now called in the IV guru, who found an alternate vein in my hand and pushed in the dye in 60 seconds. I thought I was calm now it was time to go back in and I knew what it felt like the first time. Now as I was moved into the machine I lost control. I tensed up and started having trouble breathing, my vision started having a dark fog over it, I was having an anxiety attack. I was trying to take deep breaths but they were too fast. Now the radiologist put his hands on my arm and his touch helped ground me, his calm voice encouraged me to calm down and relax. I felt my shoulders unclench, I started being able to breathe again. I quickly snapped out of it and was able to calm down, it felt like an eternity but it couldn’t have been more than 3 minutes. He handed me the call button, told me only 11 minutes left, and calmly hurried to get it done. I was just fine until it was over. I was thrilled to have the mask removed! I was totally ready to jump off the bed, he had to remind me he had to lower the bed before I could get down. He told me my results should be ready by Friday and complimented me on being able to regain control, he said that very few people he has worked with could pull it back together. I walked out happy that I did it without sedation and hoped that I don’t have to do that again for a long, long time! My daughter starts her first day of preschool tomorrow. I will be dropping her off at the school she will be attending for elementary school, in hopes that it will be a good transition into her being comfortable with her school and surroundings before going kindergarten. She will go to school two days per week for two and a half hours each day. My daughter has had horrible separation anxiety, just last year that separation anxiety led me to have to quit my job. Now I am truly hoping that she has no problem leaving me tomorrow. She will have two friends in her preschool class to hopefully help her feel comfortable with staying. I am afraid it will not be a seamless transition when I leave her there on her own. I am OK with her growing up, I am just afraid that the same horrible separation anxiety and throwing up episodes that we worked so hard and finally got past last year, might sneak back into her mind again. I will be positive and have faith she will be fine with her new big kid place, preschool! I forgot to publish this last night and here is the update- She did great! She was excited to go in, she smiled in her pictures, she sat down and played with the other kids, she said to me “Bye Mom”! I have to admit that I worried the whole time I was gone that I was going to get a phone call to have to pick her up, but the phone never rang! She was happy when I picked her up! She told me that she played with play-dough, then they had carpet time, read a book, sang a song, did a project, washed their hands, had a snack of mini teddy bears, went outside to the playground and then I picked her up! Ahhhh! It is so nice to pick up a happy kid!